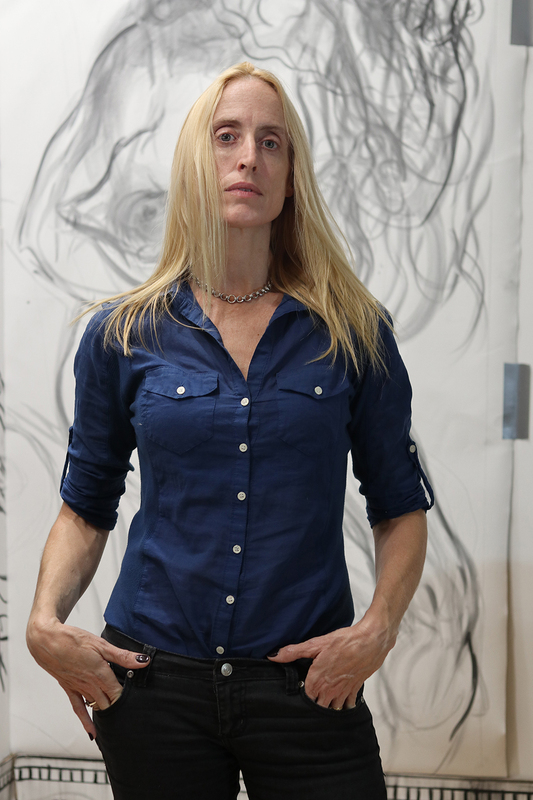 Rebecca Léveillé, a graduate of Pratt Institute, is a contemporary artist working in a figurative mode. Freely mining both art historical sources and contemporary painting, she cites influences ranging from Titian to Walter Robinson, from Fragonard to Kara Walker. Never directly quoting the work of other artists, her practice involves a translation of pictorial practices and inner mythologies through her distinctive ability to compose lyrically gestured figures largely from imagination. Léveillé’s facility with the figure and drawing was the central to her successes as an illustrator (working under the name Rebecca Guay) in the 1990s to the mid-2000s. Breaking out of the prescriptive narrative mode of illustration her relationship to language persists, yet the narrative potentials in her current work are subverted by her determination to create that which is poetic rather than literal. These personally driven explorations delve into sensuality, the female gaze, media imagery, and examining collective mythologies and pop culture and its influence on identity from the perspective of a one-time creator of pop culture within mass market imagery. A constant subtext of Léveillé’s art is her relationship to materials. 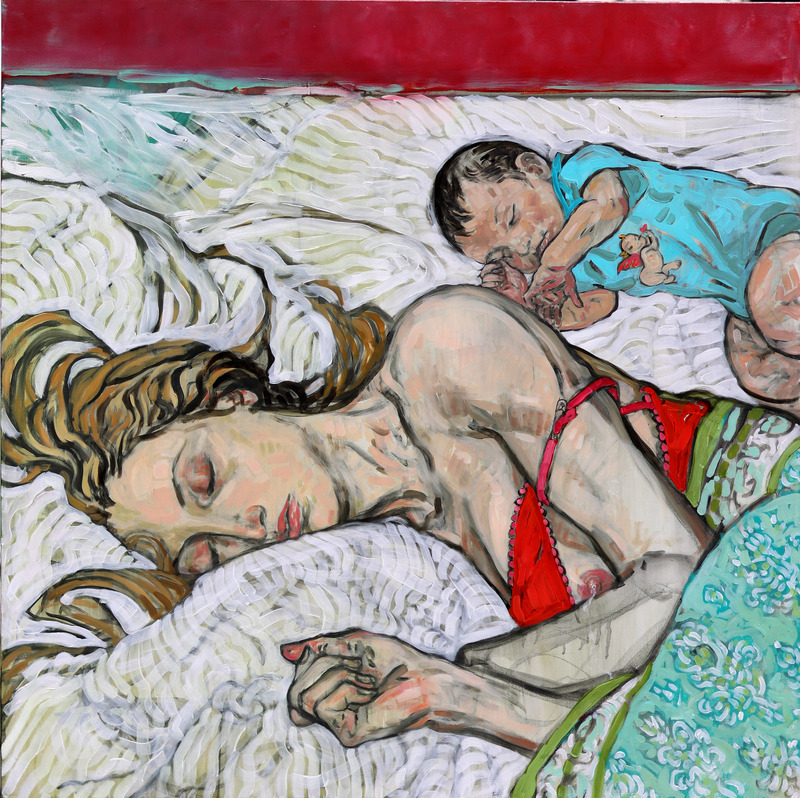 Thick buttery paint forms the confident wide lines of the drawing in her oils. Washes drift below impastos. Pencil and graphite powder bear force of mark and streak. The assertion of materials never overwhelms the creation of pictures, yet it forms an ever-present and voluptuous tactility with meanings of its own. As an emerging artist within contemporary painting, Léveillé’s art has garnered words of praise from Jerry Saltz, Walter Robinson and Peter Frank. She has opened solo shows in New England, Los Angeles and New York City. Her most recent show in May 2018, The End Of Love (at Untitled Space, NYC) was featured in Juxtapoz, New York Magazines Bedford+Bowery, and was an "Editors Pick" on ArtNet the week it opened. Other group exhibitions include shows with the Untitled Space curated by Indira Cesarine (One Year of Resistance, Secret Garden: The Female Gaze on Erotica, She Inspires, and Uprise) The LBIF Annual Drawing Exhibition 2017 juried by the Whitney Museum's Jane Panetta and The Spring Break Art Show 2018. Léveillé currently lives in western Massachusetts with her husband and daughter. Leveille resides in Amherst, Massachusetts. Maenads, Oil on canvas, 48" x 36", 2016. The Panel Discussion (The Lovers), Oil on canvas, 48" x 36", 2017-2018. To the End of Love, Oil on canvas, 36" x 36", 2017-2018.